The Bayern Rangers are both a competitive and recreational ice club of DOD ID cardholders. The team was formed in 2009 to represent the U.S. Army in Bavaria at an annual U.S. Air Forces in Europe military ice hockey tournament. All three Rangers teams cleaned house Feb. 15-17 at the 26th Armed Forces Alpine Classic in Garmisch. 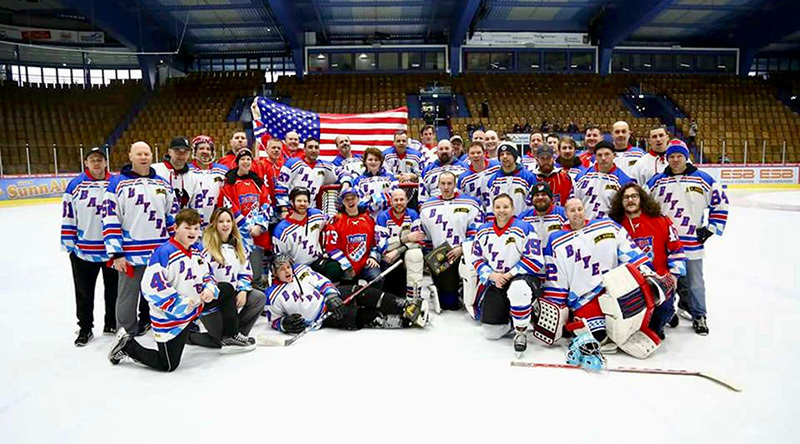 GARMISCH, Germany — The Bayern Rangers US Army Ice Hockey Team took Garmisch by storm this past weekend. Representing U.S. Army Garrison Bavaria the team showed up in force for the 26th annual military ice hockey championships with 45 players on three teams representing the military forces stationed in Bavaria. The Armed Forces Alpine Classic tournament — held annually in Garmisch at the KMC Eagles hockey rink— hosts military teams across Europe. Nineteen teams from all over the U.S. European Command (EUCOM), including teams from Italy, Belgium and England, competed in A, B and C divisions. The Rangers’ competitive team, Bayern A, won Division 1 and top tournament honors by going 3-2 in pool play and winning semi-final and final games against the Stuttgart Mustangs and KMC Eagles, respectively. The Rangers’ highly skilled and spirited B squad fell victim to tie-breaking mechanisms that kept them, with their respectable 2-2-1 record, out of the semi-finals. The Rangers’ recreational team shocked the C group by going a perfect 6-0 to win the third division’s pool play, semi-finals and finals. The Bayern Rangers are both a competitive and recreational ice club of DOD ID cardholders. The team was formed in 2009 to represent the U.S. Army in Bavaria at an annual U.S. Air Forces in Europe military ice hockey tournament. This year was the club’s ninth trip to Garmisch, in what began as an annual military championship sponsored by USAF-E. That changed in 2014 when, due to funding cuts, the KMC Eagles stepped in and took over running the tournament with each team paying to play. When the Bayern Rangers first played, they competed against eight teams and finished fourth. Since then, the field of teams has grown every year and a Rangers team has always finished in the top three. Bayern Rangers teams won it all in 2014 and 2018. In addition to one club winning in two of the three divisions, another tournament first this year was the on-ice re-enlistment of Staff Sgt. Rob Reilly by his teammate Maj. Matt Noss. Rob Reilly’s weekend continued on a positive note as he and the A team goalie, Pfc. Kyle “Sharky” Gregory were named the tournament’s top goaltenders for the C and A divisions. Today, the Bayern Rangers play friendly matches against local German clubs, participate in club tournaments throughout Europe, and play every February in Garmisch. The club also has U.S. players playing on local German teams such as the Knights, Bombers and Pirates in Pegnitz; the Puckbusters and Ice Sharks in Weiden; the Vilspiraten in Amberg; and a regional German women’s team in Regensburg. The team’s home rink is the Hans-Schröpf Arena, Raiffeisen Str 5, 92637 Weiden in der Oberpfalz, but the team also skates in Amberg, Mitterteich and Pegnitz. Usually, there is a once-a-week drop-in scrimmage and the club also runs children’s learn to skate and play hockey practices. All interested players can check on the Bayern Ranger’s upcoming games and practices at www.facebook.com/bayernrangers/events.